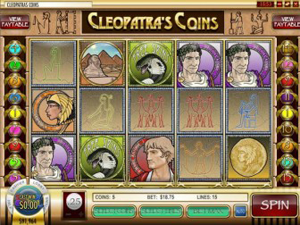 You never have to look too far to find a slot game based on ancient Egypt or Cleopatra and one of the most popular options around would have to be Cleopatra’s Coins. This is a game provided by Rival, a company who have delivered a whole lot of online slots to people all around the world. 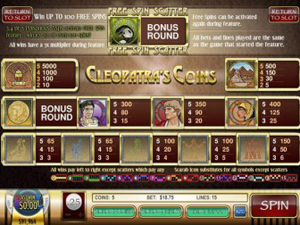 The basic outline of this game can be found in the fact that Cleopatra’s Coins are a 5 reel and 15 pay-line slot. The coin value for the game ranges between $/£/€ 0.01 and 0.25 with the highest number of coins that can be played at any one point is 75. This means that Cleopatra’s Coins is a game where you don’t need a lot of coins to play, which is always going to be of interest to a lot of casino players. For some slots fans, this will mean that there is a limit to the amount to the amount of money that can be won but for other players, it will mean that a great time can be had without fearing about spending too much money in one go! The maximum amount that a player can play on an individual spin is $/£/€ 18.75. Players will be delighted to know that there are a number of bonus options that are available with Cleopatra’s Coins but there is no progressive jackpot element. This will split opinion on the game with some players being happy that there is no progressive element whereas other casino players will feel that this is an opportunity wasted. Most players find the graphics on Rival slots to be slick and smooth and there is no reason you will have any problems with what is on offer here. The intro sequence is not for everyone and most players will find themselves skipping beyond it very quickly. This doesn’t detract in any way from the gameplay though so that is not going to be an issue for players to contend with. The Wild Symbol for Cleopatra’s Coins is a scarab, which is an amulet and the Scatter Symbol is an asp, which is a poisonous snake. The fact that there is such a strong link to elements strongly associated with Ancient Egypt will be of great benefit to people who are playing this game due to an interest they have in this particular time. The game can be enjoyed by people who have no knowledge of the era but it is the little touches that help to bring the game alive. The bonus game is a rather timid affair, based around picking vases but it is good to have a bonus option and it is one that can come around quite often for players. On the whole, this is a simple and enjoyable game that can be enjoyed by slot lovers and players that have an interest with this ancient time. The fact that it is provided by a reliable and reputable software provider will be of great benefit to slots fans.